Warhammer Tau: Tau Empire - Another Year of Waiting? Tau Empire - Another Year of Waiting? Warhammer Tau sat on the fence while the Tau rumours were flying thick and fast. Unsurprisingly, it all turned out to be a load of rubbish based on conversions, wild speculation and wish listing -just as I had said all along! But what does this mean for the Tau now? On the bright side, it means that we potentially have a whole year to build our armies! Could you honestly say that if a new Codex landed tomorrow that you'd be able to build, paint and play all the new releases? Of course not. And that's why I'd say that waiting is a good thing. After all, you simply need to look at the trends in the latest Codex books to see which direction the game and the armies are taking in general to get a feel or what might come further down the round. Right now I see a lot of complaints that Tau struggle to hold objectives. This has always been true. Yet, their background never indicates the need to claim static objectives. The fluid tactics of their Hunter Cadres are focussed on mobility and dispersal before delivering the killing blow -usually with lots of Crisis Battlesuits. I also see a lot of competitive players creating Tau armies in this way with minimal troops and maximum battlesuits with the intention of blasting the enemy off the board. I have even heard claims that missile pod spam gives Grey Knights a good run for their money. It seems that the traditional Tau tactic of popping all the transports before falling back while gunning down the infantry with basic weapons will never go out of fashion. Stunning strategies aside, Blood Angels are still a problem with their Feel No Pain saves all over the place. But who knows what 6th edition will bring? We will only know once we start playing it. I am really hoping we learn... something... soon. There is a level of comfort with what we have for now, though. I am ready to hunker down and get my army completed! I don't know, man... I don't think I agree with you. Maybe it's that my position is different: I'm a relatively new player and I don't have a ton of Tau models to play around with. So, I'm not as much "playing around with the models I own, building neat lists and struggling, but winning the occasional game. I've got enough models for one list - and not even 1500 points at that - and no room to maneuver, except in battlesuit loadout. At the same time, the things I most need - more battlesuits - I least want to buy, from hope that we will get some new and less boxy-looking sculpts. In other words, if I didn't have my Blood Angels army, I'd be very frustrated with Warhammer 40k. I'm not sure I'd still be playing. I hope this long period of delayed resculpts and a non-competitive, inflexible codex passes soon, so I can get back to my Tau! I have to say that I also disagree that it is a good thing. I can easily field about 6k worth of Tau, and I have way more than I would like to have unpainted and unassembled, but I would much rather *know* where we are in the production schedule. 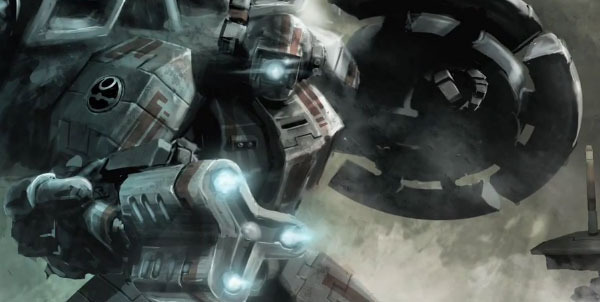 Outside of the people at GW, no one can say for certain what is happening with the schedule, so for all we know, Tau could be the next Codex to be announced, So I don't really think there's any need to say yay or nay to any of the rumours. Until the Tau codex is released, we simply won't know which rumours are true, and if any rumour mongers claim to know the truth, then I'd expect them to back it up with a good track record of accurate rumours. Has 40K Lost Its Way? Rapid Fire - More Shots, More Kills!